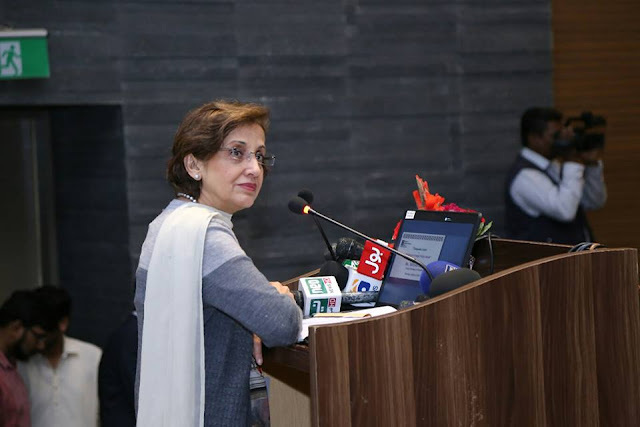 Karachi Jan. 06, 2018: The IBA Karachi hosted a Distinguished Lecture on Pakistan’s Foreign Policy Issues, delivered by the Foreign Secretary of Pakistan, Ms. Tehmina Janjua at the JS Auditorium, IBA City Campus. The event was attended by foreign delegates, prominent personalities from the corporate world, the IBA graduates, faculty and students. Dean & Director IBA, Dr. Farrukh Iqbal welcomed the audience and highlighted that the IBA is more than just a business school. For the past 20 years the IBA has a strong Computer Science department and recently the IBA has diversified through establishing departments of Social Sciences and Journalism. Ms. Tehmina Janjua started her presentation by highlighting the objectives of the Pakistan’s Foreign Policy, which involves pursing mutually beneficial relations with other countries, safeguarding national security and geo-strategic vital interests and strengthening Pakistan’s economic potential investment. Ms. Janjua elaborated that Pakistan’s foreign policy objectives are achieved through regular monitoring of changing geopolitical environment and providing recommendations to leadership for necessary adjustments. The Foreign Secretary mentioned that despite the recent hostile and antagonistic statements by the US leadership, Pakistan believes in engagement with United States. She asserted that Haqqani network is not working inside Pakistan. However, on the contrary, the enemies of Pakistan are gaining foothold in Afghanistan. Ms. Janjua said that Pakistan is ensuring an honourable return of Afghan refugees and is working on their rehabilitation. Ms. Janjua informed the audience that Pakistan needs to engage and build relationships with other countries than US and is maintaining a flourishing relationship with Russia. Pakistan’s focus lies in strengthening of exchanges with Iran in the field of trade, commerce and border management and maintaining our principled position for a comprehensive dialogue with India without any preconditions. The Foreign Secretary expressed her desire to develop a working relationship of the IBA with Ministry of Foreign Affairs in four areas involving methodology of developing case studies, developing Result Based Management System for the Foreign Office, Innovation and Promoting Pakistan as a brand. The presentation was followed by a Question and Answer session. A shield was presented as a vote of thanks by the Dean & Director IBA, Dr. Farrukh Iqbal and Associate Dean IBA, Dr. Huma Baqai.